SWR Pipes are generally made as per IS:13592. The said pipes require standard quality sealing products for leak proof performance. Leveraging on our expertise, we offer optimum quality SWR Pipes. The pipes are widely used for applications in building & construction work. Our assortment is developed in tandem with the market trends with the help of advanced technology. Besides, we are proficient in processing bulk and urgent orders. SANG-V SWR ISI Pipes (SANG-V GOLD & SANG-V DELUX) are available in 75mm and 110mm sizes in 4kg and 2.5kg in Virgin Quality. 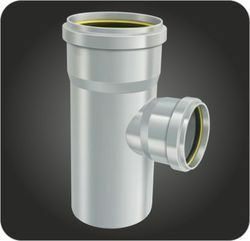 SANG-V and SANG-V ECO SWR Non ISI Pipes are available in 75mm and 110mm sizes in 4kg and 2.5kg. 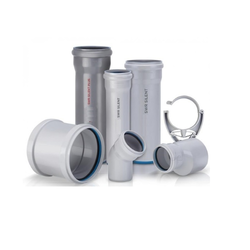 (Conforms to IS:13592)Finolex SWR pipes and fittings with integrated rings support easy and quick installation as the integrated ring is pre-fitted in the groove of the socket remains permanently positioned. The joint is made simply by pushing the spigot end into the socket end. No solvent cement is required to make joints. - Type - A Grade pipe lines connect to Gulleys & Gutters on roof top for drainage, floor wash. and hand wash water. Also used for air ventilation purpose in close pipe line and close chamber etc. - Type - B Grade pipe lines connect to Lavatories (Commodes and Kitchen sinks). ISO and ISI certified products. We are engaged in offering SWR Pipes in the countrywide markets. The SWR Pipes offered by us are made using optimum quality material. These SWR Pipes find extensive usage in sewage and drainage systems. Owing to numerous features, our SWR Pipes are high on demand in the national markets. Also, we offer SWR Pipes at very reasonable rates.